Miska a.k.a. Dr Space from Hungary learned and played traditional South-African music for years, and started his musical carrier in a psychedelic/space rock band, playing electronic drums, FX instruments and traditional percussions. As their concerts warmed up, followed by DJ/sets, he also started playing his own eclectic selection of different genres from trip-hop to psytrance. Gig by gig he felt more complete DJ-ing only for the dancefloor and played his first festival set as „Dr Space“ “ in 2009 @ 4.49 psychedelic gathering. Thence he became well-known, and is considered one of the pioneers of the underground Hungarian scene today, asked to entertain the crowds at most domestic promotion crews', as well as many international parties and festivals in Poland, Czech Republic, Slovakia, Serbia, Israel, Austria, Italy, Slovenia, etc. Since its establishment, he has been part of radiOzora’s DJ rooster and is a resident at O.Z.O.R.A. Festival. He plays in the fringe of different sub-genres without stigmatizing it dark, forest or full-on, to pace a groovy psychedelic journey around 144-150 BPM both during the day and nighttime. Tsubi has been an active member of the Hungarian psy scene since the 2000's. He has been a resident DJ of the Avatar party series since the very beginning and also at O.Z.O.R.A. Festival, where he also plays a big role in program organizing and managing the festival's web radio. In the past years he has played at all the noteworthy local psytrance events, in many European countries, and has also been invited to perform in Japan, India, Israel and Brazil. From the mega summer festivals besides O.Z.O.R.A. he has blasted the dancefloors of Boom, Sonica, Glade, Full Moon and S.U.N. festivals too. As regards his style, Tsubi loves and is able to move among a really wide spectrum of sounds, he is relentless (and unwavering) in his search for the most contemporary soundscapes and the most unique tracks. With his two other projects, TSB and Tsu, his focus is on downtempo and techno, respectively. Mnogook, known as Matic - first started exploring music on his bass guitar playing with local punk and metal bands. The love for dark and fast grooves with the sweet touch of the unlimited bloomed after visiting OZORA festival and later on when following the productions of Horrordelic records and Lunatic Alien records. His journey of DJ-ing began soon after joining Universe crew and now he is on his way to bring you the kills and thrills upon your feels. Indoor season is coming to an end and so is our space travel. 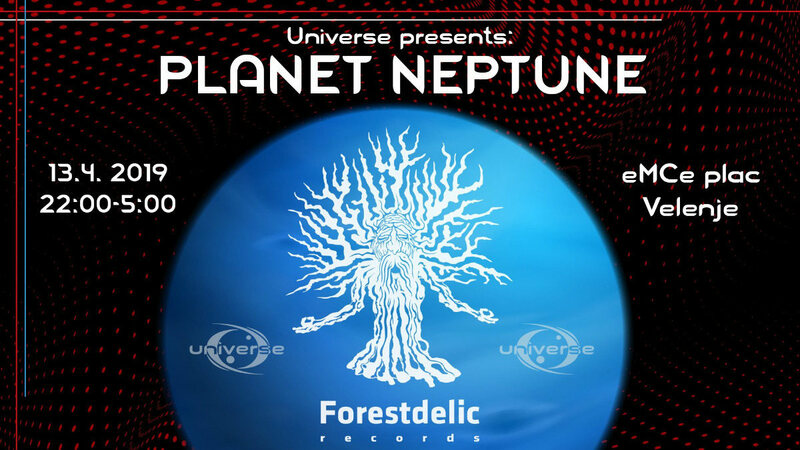 We have visited Mars and Jupiter, but our last stop is going to be planet Neptune, where we are going to host one of our favourite labels in the universe Forestdelic records. After this event we made a plan to travel back to earth where the festival outdoor season is going to start shortly.